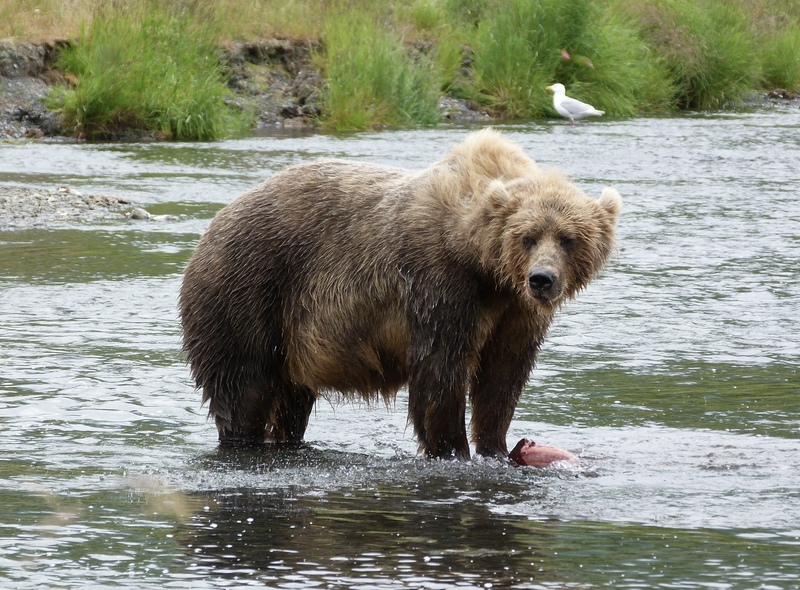 CORVALLIS, Ore. – Research shows that Kodiak brown bears that sync their stream-to-stream movements to salmon spawning patterns eat longer and more than bears that don’t, with one bear in the study consuming greater than 2 tons of fish in one summer. Individual sockeye salmon populations spawn for about 40 days, but “resource surfing” bears can fish for three times that long, biologists have learned. Worldwide, prolonged salmon availability is increasingly under threat from hatchery supplementation that tends to reduce the genetic diversity underpinning different spawning times. In addition, bears’ ability to follow salmon waves is hampered by industrial development such as mining. Findings were just published in Scientific Reports. “This study is the first to link actual metrics of bear consumption to their foraging behavior and movements,” said co-author Jonathan Armstrong, assistant professor of fisheries and wildlife in the Oregon State University College of Agricultural Sciences. Armstrong collaborated with corresponding author Will Deacy and scientists from the University of Montana, Washington State University and the Kodiak National Wildlife Refuge to collar 33 female bears and track them for a year over a 1-million-square-kilometer portion of Kodiak Island. At the end of those 12 months, the team recaptured 18 of the bears and took hair samples that they measured for mercury. Salmon absorb mercury from what they eat in the ocean, and the amount of mercury in a bear’s hair indicates how much fish it dined on – the more mercury, the more salmon it ate. On average, the bears in the study ate more than 1,000 kilograms of salmon apiece, and the more fishing sites a bear visited, the more time it spent fishing. Salmon originating from different streams return from sea to spawn at different times, making resource surfing possible. Supporting this research were the U.S. Fish and Wildlife Service, the Flathead Lake Biological Station, the OSU Department of Fisheries and Wildlife, the Interagency Grizzly Bear Committee, and the Raili Korkka Brown Bear Endowment, Nutritional Ecology Endowment and Bear Research and Conservation Endowment at Washington State. Collaborators included Jack Stanford of Montana, Charles Robbins and Joy Erlenbach of Washington State, and William Leacock of the Kodiak refuge, who did the bear collaring and tracking.